If you’re like most construction companies, you have a website you built years ago. While it’s not the most cutting-edge site out there, it doesn’t need to be. Potential customers can find and review your services, past work, accreditations, and awards—but over the years it’s mostly been used to locate your contact information. Customers are researching and vetting businesses online now more than ever. According to Forrester, buyers might be anywhere from two-thirds to 90 percent of the way through their buying cycle before ever contacting a vendor. This means your customers could be attracted to a competitor who provides more information about services and builds their reputation online—and just like that, you lost a lead. We can elevate your website to reflect the quality and attention to detail your business conveys in the field—and it starts with robust service-based landing pages, or gateways. Nearly every strategy we implement for a construction industry website redesign revolves around a foundation of keyword-packed, reputation-boosting gateways focused around your company’s specialties. Your company gets to tout your featured capabilities while prospects and search engines gain a better perspective of your business. It’s a win-win. 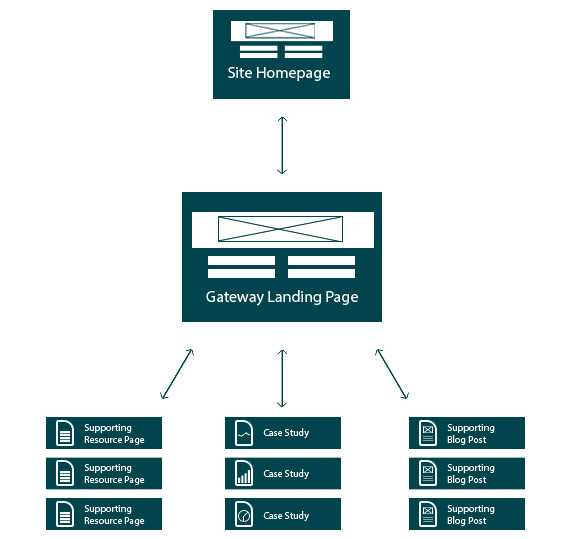 While there’s a variety of terms and marketing buzzwords around the tactic, essentially a gateway is a cluster of content, either created from scratch or pulled from other assets or areas of your website, built-out into an alternate mini-website. The cluster targets sets of semantically related keywords to attract a specific audience (in specific locations) and deliver a catered experience while also contributing to the overall domain authority of your website. How is this different than dedicating pages for each service your business offers? It’s breadth and depth. Well, maybe a graphic will help us explain. You see how a gateway isn’t a single page, but a overview parent page followed by a set of nested children pages, all focused on driving traffic to the parent page and providing potential customers valuable information that not reinforces your credibility and expertise, but also appears at the top of search results. While the content details can change according to the service or industry your construction business is targeting, the structure remains consistent. The landing page, related case studies (projects), related supporting articles (longer, research-based content), and related blog posts. An overview of service and location (e.g., Premiere Kitchen Remodels throughout Dallas-Fort Worth). Testimonials (former customers and/or current team members). More on client-testimonials here. Learn more about previous related projects (case studies). Read about how your company follows industry best-practices (resource pages). Limit the fields (and required fields) as much as possible. Project case studies is the largest area of opportunity we see working with nearly every construction client. Often companies will post before and after photos of a recent project and move on without adding more than a name and date. While seeing the photos is a great start, this section of your website has an enormous potential to convert browsers into customers, so let’s really put some thought and effort into your projects list. Project profiles and case studies are an opportunity to not only promote the final result, but also exhibit problem solving, industry expertise, and strategic consideration, throughout the course of the client-relationship. Consider expanding your list of projects before/after photos to incorporate the value that communicates the client’s goals and roadblocks and what your team did to overcome any obstacles. Even if you think you don’t have enough to say about seemingly simple jobs, try to cobble together at least a paragraph (to accompany any photos) that outlines your team’s problem/solution. A little explanation can go a long way. This is where the investment in continual content creation and photograph can really pay off for your construction business. We suggest building your gateway with no less than three supporting case studies and try to add two a year, at least.